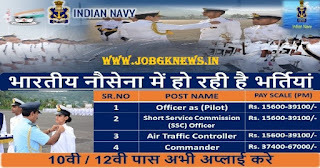 For Logistics Branch :- BE/B.Tech in any discipline/ B. Architecture with First Class or MBA with First Class or B.Sc / B.Com / B.Sc. (IT) with first class and a PG Diploma in Finance/ Logistics/Supply Chain Management / Material Management or MCA / M.Sc (IT). For Information Technology Branch :- BE/B.Tech (Computer Science / Computer Engg/ IT) OR M.Sc (Computer / IT) OR B.Sc (IT) OR M.Tech (Computer Science) (v) BCA/MCA. For Law Branch :- Degree in Law qualifying for enrolment as an Advocate under ‘Advocates Act 1961’. Age Limit :- Candidates should be Born between 02 Jul 1993 – 01 Jul 1997 for Education, Born between 02 Jul 1991 – 01 Jul 1996 for Law and Born between 02 Jul 1993 – 01 Jan 1999 for Logistics & IT. Selection will be based on shortlist applications & SSB interview. Application Fee :- There is no application fee.